I had an oncologist appointment on Wednesday morning, and I had kind of forgotten about it. It was a 12:15 appointment and I was in bed until 11:00 am. I didn’t go to bed until 2:30 am and didn’t fall asleep until after 3:30, so before I get dubbed lazy, consider the circumstances. The appointment was just to see how I was doing, but there really wasn’t a point for it. I’ll be getting a blood test in July that tells us if it’s still in remission (in the blood stream at least). Then in October I’ll have my yearly bone marrow biopsy (which will tell the more thorough story regarding my remission status). After the appointment I went back to my parent’s and tried to get stuff organized for the week ahead. I’ll have more time after the day game tomorrow, errr, today (it’s 12:05 as I type this). Day games after night games are always tiresome, but the break between the day game and the next night game makes it worth it. I can sleep when I’m dead is what I keep telling myself. 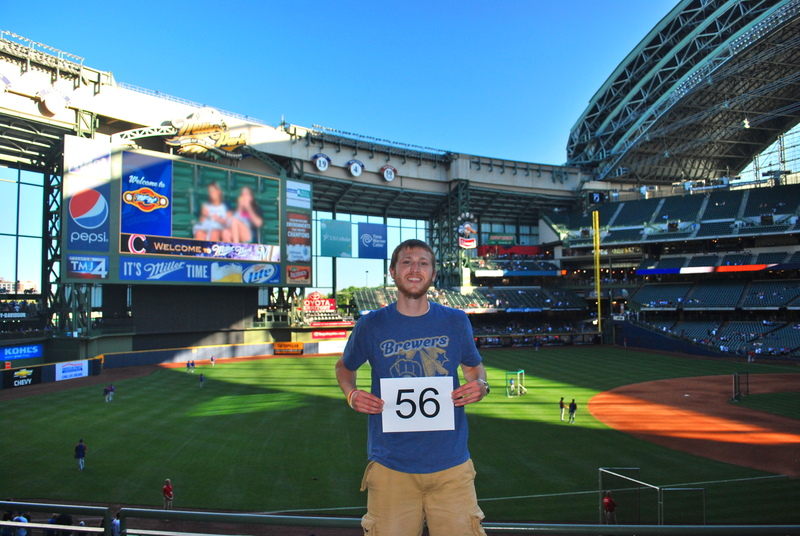 I left for the game around 3:30, and pulled into the Brewers 1 Lot just after 4:30. I got there extra early yesterday because I wanted to make the trek to the general parking lot and hit up people back there. I think (and this is just speculation), that there are more young people in the general lot, because I hadn’t been back there yet to promote what I’m doing. It’s the younger people that I’m encouraging to join the registry since they’ll have more years of being a potential donor. I also talk to older people and encourage monetary donations. It doesn’t make much sense for people in their late 50s to join the registry if they’re only going to be in there for a few years. Be The Match needs both monetary donations, and also people willing to be a donor if they’re called upon so it’s kind of a balancing act on their part. I went back to my car just before six to grab my stuff, and was inside by 6:05. I had been tweeting that my second ticket was available again, and at the last second @JasonLatus said that he’d join me at the game. After talking to him at the game he said that he had seen my tweets from earlier in the day, but once crunch time came he stepped up to the plate and delivered with a $40 donation to Be The Match. 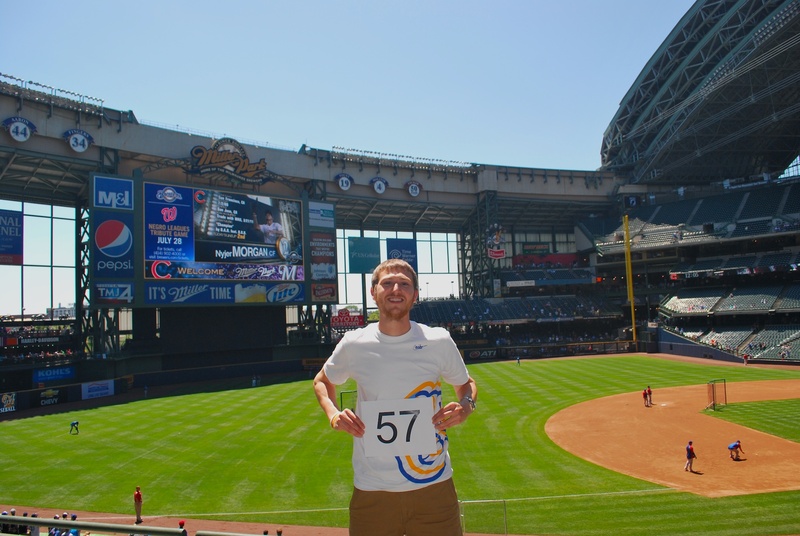 I was already inside with the ticket when I saw his tweet, but I was able to leave it at the ticket window inside Miller Park, and they took it to the will call window. Once inside I went to section 228 and got game photo number 56 taken by a nearby fan. He took three pictures and they were all pretty good. The third one was the best, but when I went to scale the image size down just now I noticed that the jumbotron had two girls in the stands on there when the picture was taken. You may not have noticed it, but it’s going to bug me. I still like it better than the other two, so I’ll have to live with it. I tried to blur them out even more than they already were, but it’s still somewhat of a distraction. 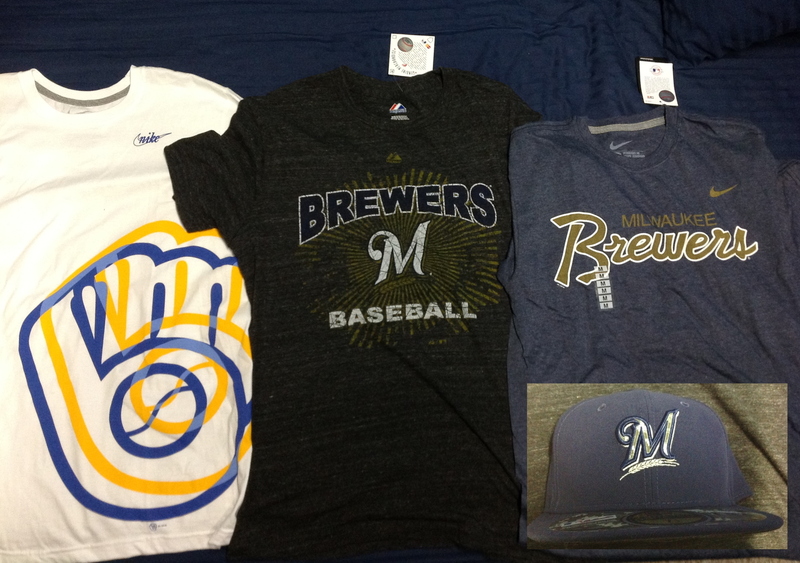 I met with Nathan in the team store by Friday’s, and he handed off the new gear that the Brewers are providing. Kathy and Tyler: I know you read the posts so I can’t say thank you enough for the merchandise and everything else you guys have done for me. Jill (the merchandising director) gets a nod as well because she worked with Kathy and Tyler to figure out how it would all work. Below are the three shirts Nathan picked out for me, and the hat that the Brewers will wear on July 4th (The fill inside the M is camouflage). I think they wore it on Memorial Day also, but I’m not certain. I was in the Upper Deck at Dodger Stadium that day, so I didn’t get any close looks at the players. I talked with Bill (the usher) again and then while walking to my seats Jason caught up with me. 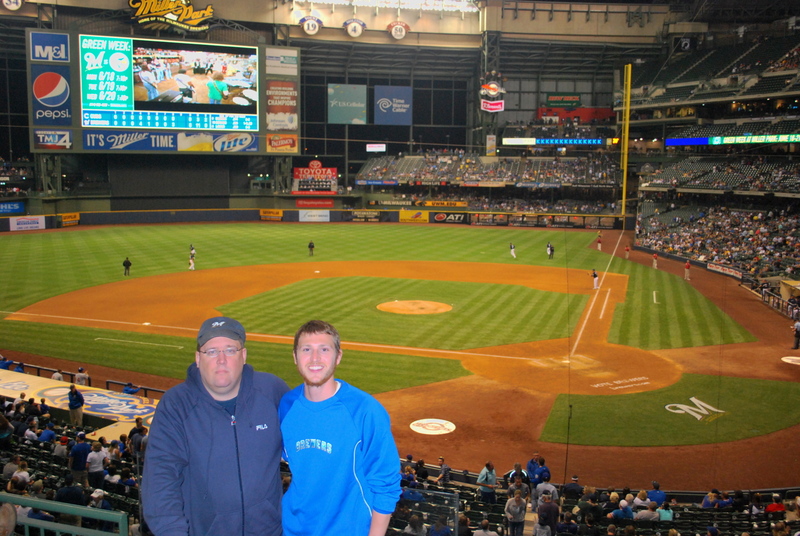 We got situated for the game and with Greinke on the mound I was feeling pretty good about the Brewers chances. 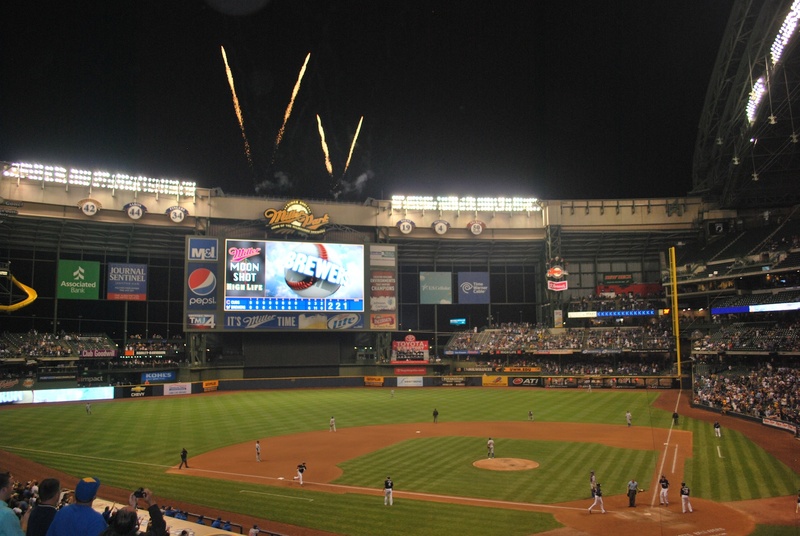 The game was scoreless early but in the fourth inning the Brewers got on the board in a big way, with four runs on five hits. 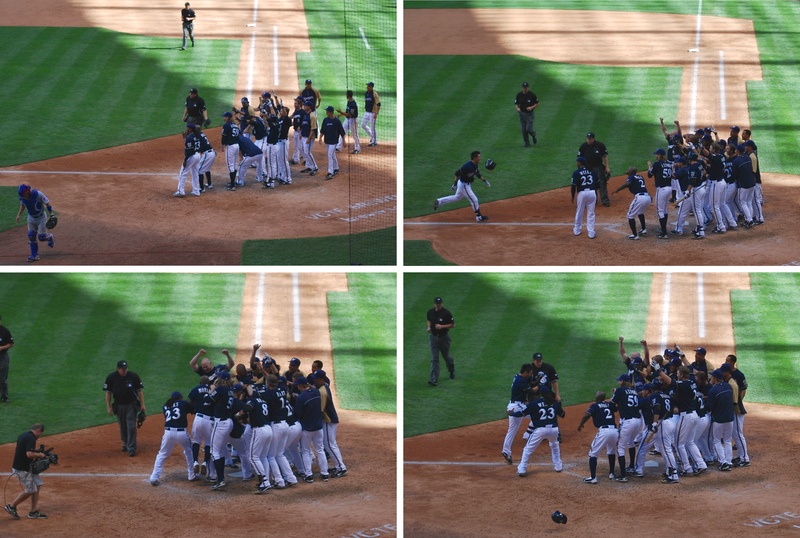 Three of them scored with two outs so that was nice to see. 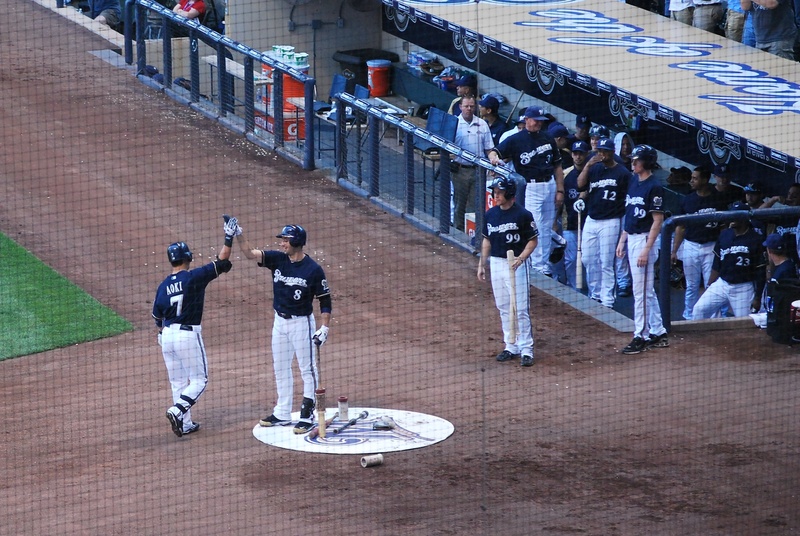 Braun’s double scored Aoki, Ransom’s double scored Braun, and Conrad’s single scored Hart and Ransom. I got a picture as Ransom slid home safely, and again I wish I had a faster lens. The shutter speed for the below photo was 1/125 of a second, and I probably needed a 1/400 picture to achieve decent clarity. I’m starting to seriously consider purchasing a nicer lens. The $1,000 price tag is (obviously) the only thing holding me back. So I can either man up and lay down the cash, or start asking players to do things more slowly so I can capture their actions better. I would prefer the latter but I’ll probably wind up doing the former. In the top of the fifth Greinke had a chance to strike out four in an inning because a wild pitch on strike three allowed Ian Stewart to reach. The next at bat ended with a strike-em-out-throw-em-out double play and it’s apparent that Maldonado has an amazing arm behind the plate. 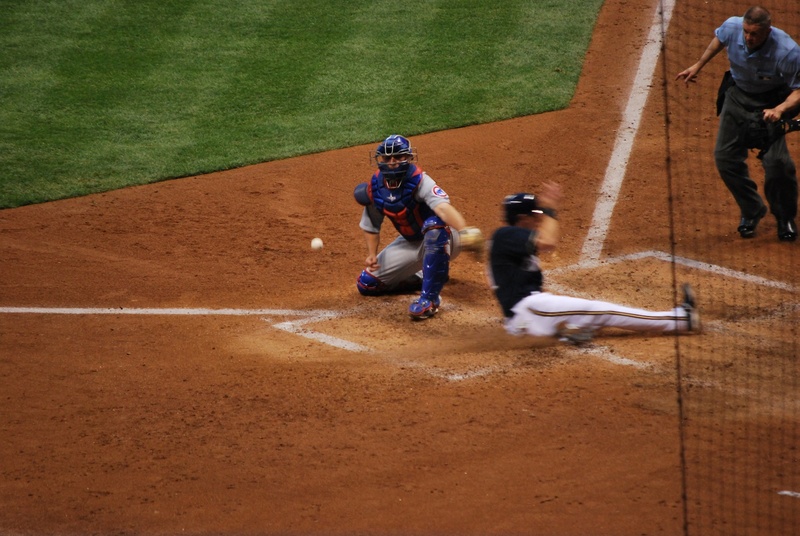 Lucroy is a great defensive catcher, and has a decent arm. If he had the arm Maldonado has he’d be right up there with Yadier Molina of the Cardinals (he’s close as it is, in my opinion). 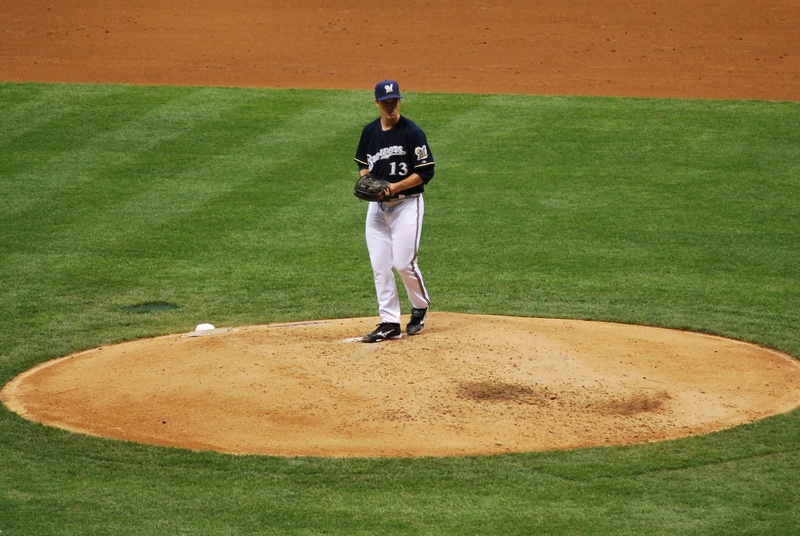 Greinke settled for three strikeouts in the inning, and had 12 in the game, while giving up just two hits and two walks. 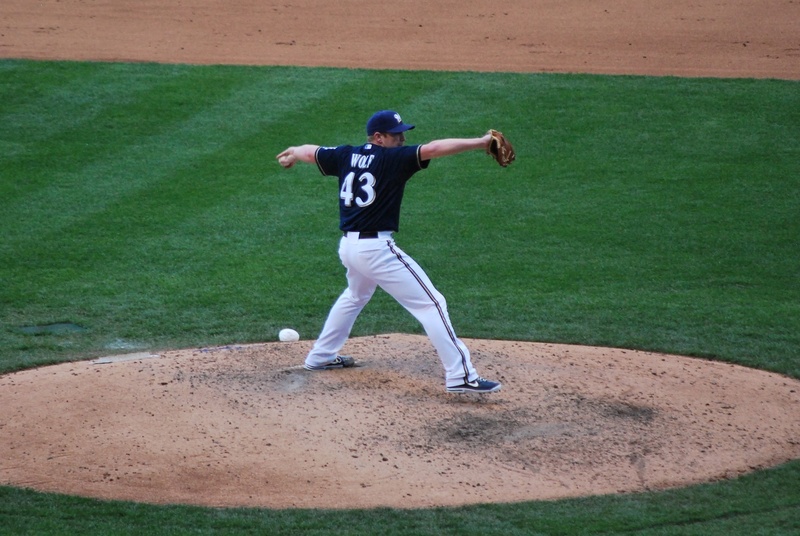 The Brewers tacked on a run in the fifth, and then blew it open in the eighth. Taylor Green hit his first Major League home run, a three run shot to right, and I knew it was coming. Ok, maybe not “knew”, but was hopeful. 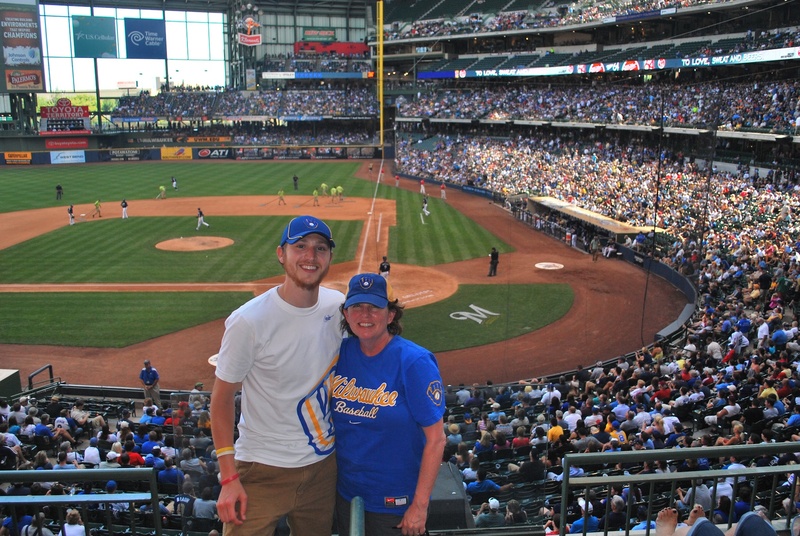 Every time he had come to the plate this year I would say “He’s still looking for his first major league home run.” My hard work finally paid off and the Brewers celebrated with fireworks after Green rounded third. This linescore is more of what I was looking for when the Cubs came to town. Final Score: Brewers 8 – Cubs 0. Some advice: never second guess yourself while picking a sausage race winner, it backfires. I went with the Bratwurst originally, and then right before they took off I changed it to the Italian. I hate Italian sausages, what was I thinking? Of course Bratwurst had a come-from-behind victory, cementing my original estimation that the tallest contestant would win (always look at the legs). My uncle hates the sausage race, and I never understood why. Look at the all the heads in the Brewers dugout, where are they looking? You guessed it, at the sausages! I know it’s ridiculous and all, but it’s a heckuva lot better than the tool race, or whatever it is that they do in Atlanta (and other parks), it’s a joke. In Atlanta they have a paint brush, hammer, hand saw, and power drill, and they wear these little boots. 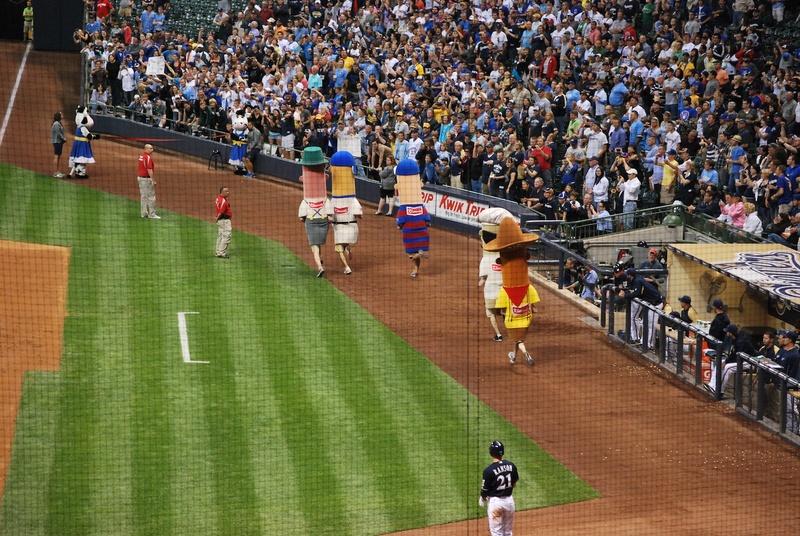 Maybe I’m a little biased, but the sausage race was the first of it’s kind, and it can’t be topped. After the bottom of the eighth inning I had a fan take a picture of Jason and I. He told me that he wasn’t very photogenic, so I hope he’s not mad about me posting the pic. He might look like he wasn’t happy, but he can confirm that we had a good time at the game. We talked about baseball, my journey, and also how cool he thinks it is. The 25-31 record has been the hardest part of the season so far, but hearing people like Jason tell me that what I’m doing is awesome and to not regret it reassures me that I made the right decision. That’s all for now. I’m going to the game today (Thursday), with a former co-worker. Her name is Pam and we’re meeting in Johnson Creek at 11:00 am. A good time should be had by all.